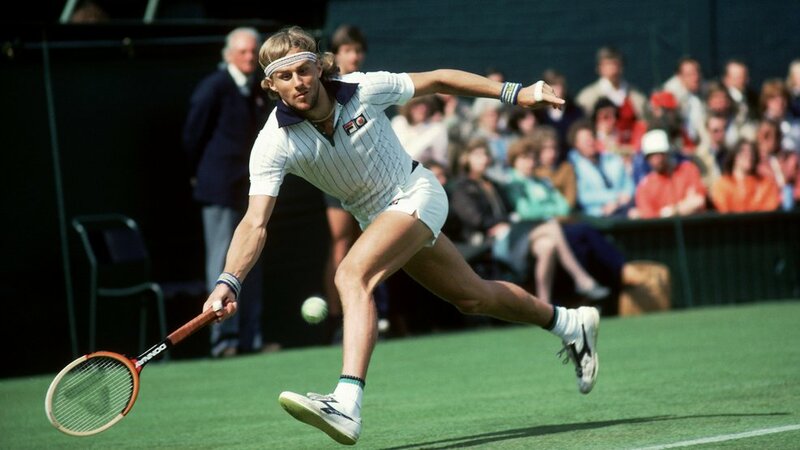 Upon reaching the 1981 Wimbledon semifinals, Bjorn Borg had won an astounding 40 straight matches at the All England Club. To reach the finals for the sixth straight year, he’d have to get past one of his most formidable rivals, Jimmy Connors. Prior to the match, Connors had even briefly consulted with Arthur Ashe, the last man to have beaten Borg at Wimbledon. And he began it on fire, winning the first set 6-0, the second 6-4. But Borg was a master at taking an opponent’s measure and gradually resurrecting himself. Five times he’d previously rallied from two sets to love down to win. Now, toothpick by toothpick – and with a little help from his serve, which issued 16 aces – he fought back. Borg won the third 6-3 and then the fourth, 6-0. This was a crackling match, highlighted by dozens of lengthy baseline rallies, with Connors persistently trying to force play and strike sizzling shots, Borg scuttling across the baseline with exceptional speed and poise. All told, Connors in this match would hit 48 winners to 30 for Borg. Connors in the fifth was repeatedly in trouble on his serve. At 1-1, he fought out of a love-40 deficit. The same at 2-2. And again, at 3-all, Connors went down love-40. But at 30-40, he struck a forehand long. So once again, Borg was in the Wimbledon finals, set for the second year in a row to play John McEnroe. But while it was one thing for Borg to lose that match to McEnroe, no one dared imagine that he would never play Wimbledon again. And a year later, Connors would win Wimbledon.